And heat-related deaths among the elderly will triple to 7,000 a year by the 2050s as summer temperatures rise. The UK is not prepared, the committee says, for the risks posed by climate change from flooding and changing coasts, heatwaves, water shortages, ecosystem damage and shocks to the global food system. It identifies 60 risks and opportunities - many of them happening already as the climate has warmed. Its conclusions on the inter-linking nature of threats to infrastructure is based on recent research. The chairman of the committee's adaptation sub-committee, Prof Sir John Krebs, told BBC News: "Infrastructure could be affected in a way that interacts. "There could be a cascade of risks." On food and farming, the committee warns that UK shoppers could face higher food bills as imported crops like soya are harmed by heat or drought. The committee also says some of the UK's most fertile land - the peat fields of the East Anglia fens - are suffering badly from decades of intensive farming. On over-heating, the committee forecasts a risk to the health of elderly people in homes, hospitals and care homes. Prof Krebs said he had tried to insert rules in recent housing legislation to oblige builders to ensure adequate ventilation, but the government deemed these onerous to business. Dr Sari Kovats, from the London School of Hygiene and Tropical Medicine, said: "We are far from prepared to deal with these changes. "More heatwaves in the UK are also likely, yet there are no comprehensive policies in place aimed at reducing the risk of overheating in new and existing homes." • Milder winters should reduce the costs of heating, helping to cut winter cold deaths. Prof Piers Forster, from the University of Leeds, said: "The UK gets off lighter than many countries but this important report confirms that we are already seeing damage to homes, businesses and livelihoods. "There are a few opportunities hidden in the mix but the future is clearly one of increased risk that we need to prepare for now." The report will inform the government's climate change adaptation strategy, due in 2018. Ministers are about to publish their National Flood Resilience Review. 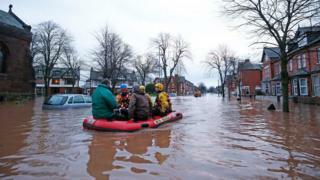 A government spokesman said: "We are committed to making sure the UK is prepared for the challenges of climate change. "That is why we are investing record amounts in flood defences, developing a long-term plan for the environment and reviewing planning legislation so new construction projects are sustainable and resilient."